Cleary began his softball journey with the Conception Bay Central Minor Association and has since developed into one of the country’s best pitchers. He has competed in six Canadian Championships beginning in 2009 and has earned three Gold medals, one silver medal and one bronze medal as a key component of the 3 Cheers Pub team out of Newfoundland and Labrador. Cleary’s first international experience with Team Canada came at the 2013 ISF Men’s World Championship in New Zealand, where he had a 2-1 record and struck out 24 batters in 13.1 innings of work. He followed that success at the 2014 Pan American Championship, leading the tournament with 65 strikeouts in 30.1 innings as he went 3-0 to help lead Canada to a Bronze medal finish. 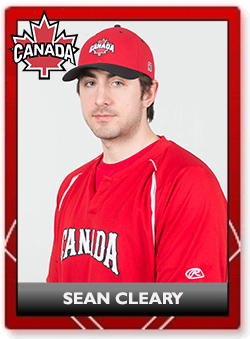 Click here for the Sean’s official profile at Softball Canada. For more at Fastpitch West on Sean Cleary, click here.